Watercolor and ink. Cheers, stay cool. Painted by hand. 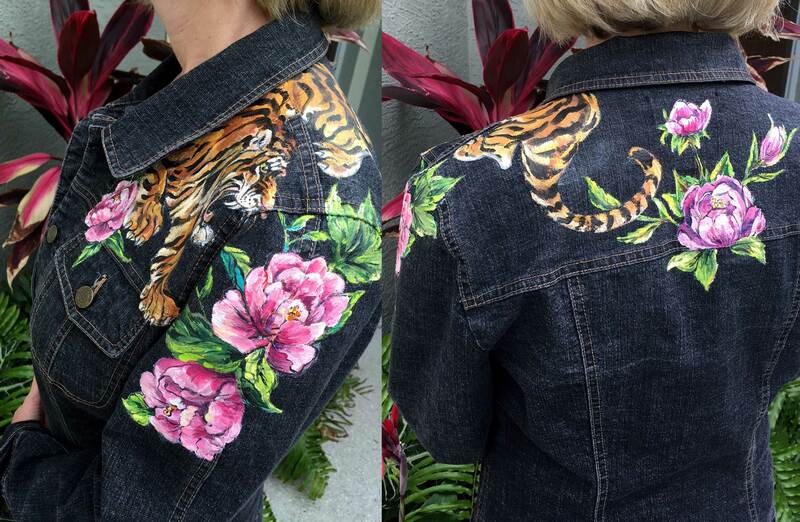 Peonies, butterfly, and hummingbird on denim jacket. Custom painting offered on personal jacket items. Visit LouisMillerStudio.com through link on this page. Who needs a cocktail? Margarita and Sailboats on a thick, little canvas 8 x 8 in. Perfect for a limited space and for keeping you in your happy place. Cheers. Drop us a note if would like one. If you happen to be in south Florida sometime this year and have an appetite for Mediterranean cuisine and intriguing abstract art, check out a place offering both. The Fandango cafe in Sarasota on the west coast of Fla is showing a series of my large abstracts. Prices range from $250 – $325 framed with glass. It’s a unique display to see. Painted by hand, Wild horse and sunflowers over the shoulder embellishment for a standout piece in denim. Ladies’ medium, $150. Keeping it fresh for summer, hand-painted canvas tote. Visit LouisMillerStudio.com (a link in menu above) to see more bags and apparel- all one-of-a-kind pieces. Embellished and up-cycled denim jacket. Over the left shoulder design continued around to the upper back. A floral and animal motif, a balance of delicate and ferocious. One-of-a-kind, painted by hand. Tiger with Peonies. Ladies size medium. $595 See more at LouisMillerStudio.com.